MEXICO CITY, Jun 20 2012 (IPS) - Water shortages, hotel development projects, overfishing and the impacts of mining activities are among the main environmental problems in the region of Los Cabos, the venue for the summit of the Group of 20 (G20) leading economies. The G20 Leaders’ Summit, which took place Jun. 18-19 in Los Cabos with sustainable development and combating climate change at the top of the agenda, was held in the International Convention Centre, considered the ultimate in sustainable architecture. Within its 66,000 square metres are 2,700 square metres of green walls, a water treatment system with the capacity to process 2.6 liters per second, more than 1,000 solar panels to supply electricity, and rainwater collection facilities. It is an artificial oasis in the midst of a region that exemplifies a host of bad practices. The municipality of Los Cabos, in the state of Baja California Sur, is made up of the towns of San José del Cabo (the municipal seat) and Cabo San Lucas. Both are economically dependent on tourism, mainly foreign. They are connected by a 33 km strip of luxury hotels, which take a heavy environmental toll. “The main problem is the scarcity of water. Because this is an arid region, it is the most limited resource. 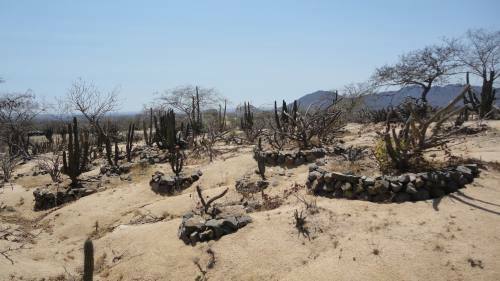 The aquifers are already overexploited, and new hotel development projects could seriously affect the water supply,” activist Ernesto Vázquez of the non-governmental Niparajá Natural History Society told Tierramérica*. The organisation, founded in 1990, works for the conservation of natural resources in the state of Baja California Sur. Located in what is essentially a desert region, Los Cabos receives about 270 mm of rain annually. Within its territory lie a number of protected areas, including the Sierra La Laguna Biosphere Reserve, the Cabo Pulmo National Marine Park, the Estero de San José del Cabo State Ecological Reserve and the Cabo San Lucas Submarine Flora and Fauna Refuge. All of them are home to protected, threatened and endangered species. “For a long time now Los Cabos has been facing problems caused by tourism development and population growth without proper urban planning. Urban sprawl has eaten into areas that had significant environmental importance,” said Isaí Domínguez of the National Commission for Knowledge and Use of Biodiversity (CONABIO). “It was an area of considerable ecological wealth. What is left is very little,” he told Tierramérica. Los Cabos first took off as a luxury tourism destination in the 1950s, and underwent a boom in the 1990s. It has more than 10,000 hotel rooms and received more than 800,000 visitors in 2011, according to the state Ministry of Tourism. The mining of gypsum, copper and phosphorite, which dates back to the 19th century in the region, has also left its scars. CONABIO lists erosion, coastal pollution from solid waste and wastewater, tourism mega projects, the conflict between sports and commercial fishing, and environmental damage from ships among the main problems facing the area. The Mexican branch of Greenpeace reports that average daily water consumption is 250 liters per inhabitant, but in the big hotels, it ranges between 1,000 and 2,000 liters. On Jun. 15 Mexican President Felipe Calderón announced the cancellation of the Cabo Cortés tourism development project, although he did not rule out the possibility of a new project that better adhered to scientific and environmental criteria. The Cabo Cortés project involved the development of an area of 3,800 hectares, with plans for around 27,000 hotel rooms, two golf courses and other recreational facilities, which would have posed a danger to the coral reef off Cabo Pulmo, a national protected area. Cabo Cortés would have also caused harmful impacts on sand dunes that stretch over several kilometres. Meanwhile, since 2009, the U.S. mining company Vista Gold has been waiting for permission to develop an open pit gold mine formerly known as Paredones Amarillos and now known as Concordia. Local residents are opposed, and approval of the environmental impact assessment for the project is still pending. This mining operation would affect the Sierra La Laguna Biosphere Reserve, which was created in 1994 and encompasses both pine and oak forest and jungle areas. “This is an important fishing area and the chemicals used to separate the metals would create wastes that would hurt the industry,” said Domínguez. Every year, 26 million cubic metres of water are extracted from the San José del Cabo aquifer, but its recharge rate is only 24 million cubic metres annually, according to the National Water Commission.